To buy “On the Verge of Photography” click here. 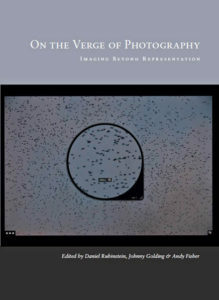 On The Verge of Photography: Imaging Beyond Representation is a provocative and bold rethinking of photography in light of the digital transformation and its impact on fine art, culture and society. Addressing the centrality of the digital image to our contemporary life, the fourteen new essays in this collection challenge the traditional categories of photographic theory – that of representation, evidence, documentation and the archive – and offer a fresh approach to its impact on aesthetics, contemporary philosophy and the political. Drawing on the networked human condition of embodiment, social-media, and bio-politics, On the Verge of Photography offers an invaluable resource for students of visual culture, researchers in the field of digital imaging and artists working with new media. – Ariella Azoulay, Media/Comparative Literature and Modern Culture, Brown University.